While it's fun to scan house decor and that big screen TV you hope one of your guests will be cool enough to buy, cash would be a lot more helpful to you and your soon-to-be spouse. You don't need fancy place settings or sheets with a high thread count, but how can you ask friends and family members to skip the shopping spree and hand over the dough without sounding tacky? Here are three strategies that work. You aren't the only one who wants cash gifts for their wedding, which is why many online donation registries are available. Sites like Honeyfund and Traveler's Joy allow you to create a wish list of items like a dolphin excursion for your honeymoon or new cabinets for your kitchen in your condo, and your guests can donate money to help you pay for those things. Your wedding guests will feel like their money is going toward a good cause, and you will be able to cash out after your wedding. During your wedding, the DJ will announce to the guests that the dance floor is now open for anyone who wishes to dance with the bride or groom. The DJ will also mention that for those who want to help the couple have an extra special honeymoon, this dance is the time to hand over the bills. The "dollar dance," also known as the "money dance" or the "apron dance," is socially acceptable and expected in many cultures. This dance is extremely awkward, but it also gives older relatives a chance to relish in this special moment and say a sweet word to the bride or groom away from the crowd. My family and my husband's family expected the dollar dance, and even though it made both of us cringe, we are glad we did it. We earned about $400 from the 20-minute dance session, and that moment gave my grandma and aunt a chance to dance and welcome my husband to the family without feeling embarrassed. I thought no one would want to dance with us, but it did end up being a sweet way to thank guests for coming and make them feel noticed. However, it is important to think about your guests. Will they think the dollar dance is a fun tradition or would they be offended? For my wedding, we were surrounded by people who just wanted to bless us financially, but we were also a young couple just starting out. Older couples that are perceived to have high-paying jobs might not get the same reaction from their guests if they did a dollar dance. Let a few close family members and friends know that while you have a registry, you are also saving money toward a down payment on a house or a kitchen renovation. Ask them to mention this to anyone who asks for registry help or gift ideas. For example, when your old school grandmother asks your mom how to work the registry, your mom can say, "I can take you shopping this week, but I heard that Jane and Mark are trying to save up for a down payment on a house this year if you would rather contribute the money to that." The idea is that your wedding guests aren't hearing directly from you that you want cash. 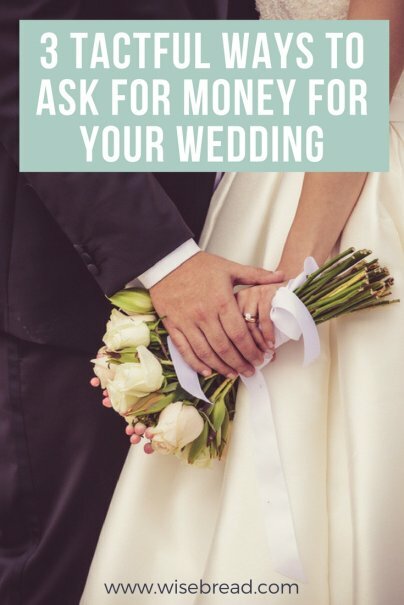 You don't want your wedding to feel like a call for money handouts. You also have to realize that many guests might prefer to give checks, but they just don't know how much to give. For example, gifting a nice punch bowl seems more gracious to many people than handing over the cost of the bowl. Word-of-mouth can also help in these tricky situations. Close friends can say, "I'm just going to give them a $40 check for their honeymoon. I know every little bit will be appreciated," when other friends ask what they are gifting.